I kinda like that imagery. 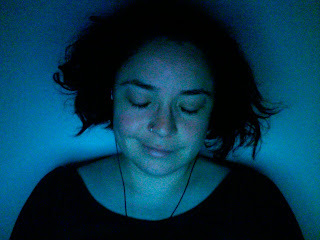 I'm happily dead to the world... and listening to music (those strings there are my beloved Bang & Olufsen headphones). In a way, that's me being a ghost, not really existing in this world, and not anywhere else. I'd like to think that if people want to think of me, they can think of me like this- somewhere outside of this world where no one can find me listening to music. For the past 2 weeks I've been working on a story that deals with this... Not very succesfully, however. Mainly I'm just feeling out the character. I've been trying to put what it feels like (and not what I'm going through) into this, however, it's hard not to color it with outside happenings and feelings. I feel like in that square... there's a tiny tiny crack that I've found and have slipped through in order to recover, to heal, to learn, and to see what is to pass next. It's as though, in that crack, time cannot move and I take that time to observe, listen, take notes and learn. It's as though I'm in a coma, but an actual living one; my body, mind and soul need to recover from the trauma and have therefore been placed in this space that's not part of life. I like the idea that, like the light in the picture, it's all a soft glow of blue. I also like to imagine that I have a comfortable sleeping place, my favorite music, books, my computer and journals for writing, and exercise. Yes, exercise. Why? Well I love that feeling of strength I get and of a nice weakness - a building of muscle weakness - and the good stretch that I get after I've been for a run or spin class or just worked with weights. I also like to imagine that I view the world as though looking out one of the windows of the house. Things are distant and the noise is muted. From my vantage point, I can't quite here what's being said, but I like the way that all sound comes in soft, muted. I can stare out the window and smile and think... one day I'll re-emerge... but not now. It's the part of the real world that scares me. It's very noisy out there and I don't know when or how I'm going to re-enter it. In the meantime... I sit... and wait. I'm sorry if this is so confusing... I'm only trying to convey the feeling I get... the "coma" sense of it. This is more of an exercise in trying to use my words, one might say. I'm just trying to give one a glimpse of life in the morgue... and it's sick that I like it. what I've always found weird about dead people is that... they always look like a shell of themselves. Well, at least the dead ones I've seen. My grandfather didn't look like he was in there... he looked like he had left the building. It was weird and I almost expected to knock on his chest and hear a hollow tin-man like sound.